Arty Party Members with their certificates. 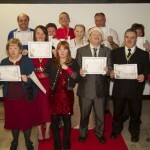 A very big thank you to the Basil Houghton Memorial Trust for funding Arty Party’s Celebrate Me! event 2012. The event was a fun filled night of Arty Party magic. This was a great evening for our Members and their friends to shout out loud and celebrate the wonderful things they did in 2012. Held at Castle Farm Community Centre, the event, attended by around sixty Arty Party Members, was full of sparkle. Arty Party Members and friends were invited to get in touch about something they were proud to have achieved in 2012. Leading up to the event, we held two Celebrate Me! workshops at a Telford day centre, attended by twenty learning disabled adults, to encourage people to think about their achievements during 2012. Thirty-six people told us about the special things they did. Achievements included gaining independence by learning to use the bus, learning to knit, starring in a film and travelling to Moscow where it was shown, taking part in an aerobatic stunt flight to raise money for charity, and overcoming fear to learn to swim. All Achievers were presented with an Arty Party Celebrate Me! Certificate. We asked Fiona Williams, from Taking Part, to choose seven achievements which deserved a medal. Fiona found it hard to choose and we are very grateful for her help. The seven winners were Basil Capp, Sam Rogers, Robert Checkley, Cherylanne Maddy, Mervyn Bradley, Rebecca Smith and Mandy Freeman. They were each presented with an engraved Arty Party Gold Star medal. Later, there was music and dancing, with DJ David Rickard assisted by Arty Party Member Jason. Arty Party’s Performance and Media group interviewed people at the event. You can listen to the interviews on our blog: http://artypartyblog.com. As you will see when you visit our Gallery, we took lots of photographs too (thanks to Mitch Morgan for this). Note to sponsors: this event was such a success that the Arty Party Members Committee has asked to run a similar event in 2013. We very much hope you will support us! Tagged 2012, awards, Basil Houghton Memorial Trust, celebrate, certificates, dance, medals, members, Social Nights. Bookmark the permalink.